You may catch yourself thinking “where did the time go?” In a blink of an eye, summer is over, and fall is right around the corner! To end the season with a bang, throw an end of the summer bash as the perfect way to part with the sunny season. 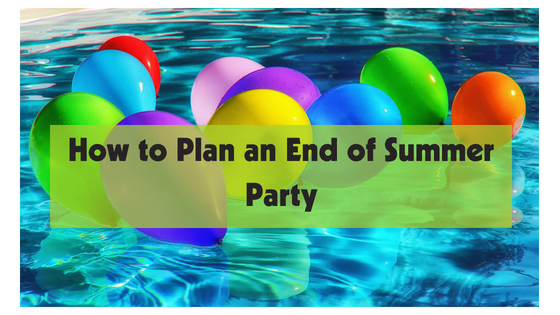 Luckily, your party planning experts at GameTruck Memphis have provided you with a how-to guide to plan an epic end of the summer party! The perfect way to relish the end of an era (or in this case, end of a season) is to incorporate all of the things that made those moments unforgettable. Playing classic summer games is the perfect way to get adults and kids alike outdoors and having fun! Capture the flag, kickball, laser tag, water tag and even a gaming party can all be great ways to kick off your party. No end of summer party would be complete without some delicious summer treats. If you want your party to be the talk of the neighborhood, make sure your guests are munching on some summertime foods. Hot dogs, hamburgers, ice pops, and fruit paired with refreshing lemonade or iced tea will keep everyone happy! Snapping photos of the amazing things that happened during the summertime is a great way to look back and relive those memories. Gather pictures from friends and family and have a photo wall or table for friends to stop by and take a look at all the enjoyable moments of summer! The perfect end to a perfect summer is essential. How do you put all those amazing memories and fun-filled adventures into one party? With the help of Game Truck Memphis, all of this is effortlessly possible with our mobile gaming arenas! Let us help you plan an unforgettable end of the summer party. Call us at (866) 253-3191 or contact us here! Not everyone is a “summer in the sun” type of person, and that is completely fine. There are easy ways to have fun this summer without stepping a single foot outside. You can get your summer fix from the comfort of your room with the company of your computer. The sunscreen-free and sunburn proof way to have the best summer yet is with summer time video games. 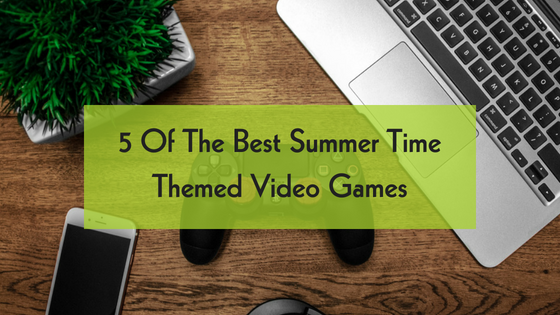 The crew at Game Truck Memphis has provided you with some of the best summer time themed video games to check out this summer! This multiplatform game is perfect for the zombie-loving beach fanatic. The main task in this game is to fight off the zombies that took over the beautiful island of Banoi. Killing more zombies will increase your health, stamina, and skill level. If you like open world roaming features in a first-person perspective, this is the game for you. Sunshine- can you get any closer to summer than that? Created for Nintendo GameCube, this is a 3D action-packed adventure game. With help from the F.L.U.D.D. (Flash Liquidizer Ultra Dousing Device), Mario completes missions to clean the dirty island from an ink spill. Your goal is to acquire shine sprites and blue coins to move on to new missions. Located in sunny Australia, this racing game offers pretty views and killer cars. The game is perfect for the car enthusiast or racing lover. You can create every aspect of your racing world- player, car, radio station and much more. Take charge of your own Forza Horizon Festival with the option of multiplayer racing,12-player online free roaming or 4-player online co-op. Forza Horizon is the game that gives you your dream car and dream location packed into one game. Time to whip out your Game Boy Advance. This game is a summer exclusive where you play a vampire hunter named Django that kills his enemies with the help of his solar gun. His mission is to save humanity from the “Age of Darkness” that has come upon the city of San Miguel. The coolest feature is within the game card that contains a particular sensor. You are encouraged to play in the sunlight to absorb the rays to shoot the bolts of sunlight from your gun. Be sure to get your hands on this game because it is available in the summer time only! Welcome to the pirate world. This multiplatform game is a summer must play set in the Caribbean with the ability to explore multiple islands and embark on crazy adventures. Set in the “Golden Age of Piracy” this game is centered in a third person point of view and gives the player the freedom to choose what they want to do. You can pick from activities, complete missions or simply explore the islands. Take a vacation to the Caribbean this summer from the comfort of your room. The team of Game Truck Memphis understands your excitement to play the best video games this summer. Grab your friends and explore our mobile video gaming possibilities- go on a beach video game adventure without sand in your shoes or the risk of getting burnt. Contact us here or call us at (866)253-3191. You already knew that video games take place in virtual universes –– that’s part of the fun of playing! But many video games encourage players to spend actual money on in-game purchases, and the Entertainment Software Rating Board is responding to concern from parents by requiring publishers to include a label indicating that a game allows in-game purchases on the packaging. So what does that mean for you? If your children love playing video games, you’ll soon be able to find out if the game you’re purchasing entices them into spending actual money. One of the most common in-game purchases is called a loot box, and it allows players to spend money and get an assortment of virtual rewards. It’s been compared to gambling because players aren’t sure whether the items they get will actually prove valuable for gameplay. 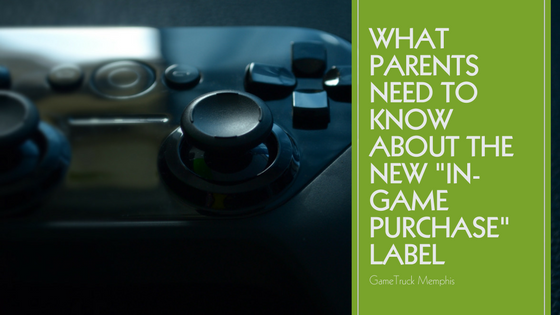 Regardless, it’s concerning that your kids could be spending real money without your knowledge, which is why this new labeling measure may make life easier for parents. The ESRB says the new rule is targeted toward parents concerned about the games they buy for their kids, although it isn’t yet clear where the “in-game purchase” notice will appear on a game’s packaging. This will make life easier for many people, though –– instead of spending time researching individual video games before buying, you’ll be able to glance at the cover and find out whether transactions are part of the game. You can also have conversations with your child about in-game purchases and the real-world consequences of spending money irresponsibly. If you want to make sure your child enjoys video gaming without having to worry about potential repercussions, our team at GameTruck Memphis would love to chat with you. We’ve been hosting mobile video gaming parties for seven years, and our events are custom-tailored to match your specific audience and needs. Not only do we have a range of age-appropriate games, but an expert gaming coach is at every party to make sure that everything goes smoothly. Find out more by calling us at 866-253-3191 or clicking here for a pricing quote.